Mew is coming to Pokémon GO, but you won't catch a glimpse of the magic space-kitty until Professor Willow sends you on a bunch of research missions. Starting this week, Pokémon GO players can participate in research tasks of varying difficulty. By successfully completing the tasks, you can earn reward items, access story threads related to the Mew-hunt, and even experience special Pokémon encounters. There are two types of research to participate in. When you conduct "Field Research," you're given objectives when you spin PokéStops. These objectives include discovering / catching certain Pokémon, getting into battles, and other tasks. 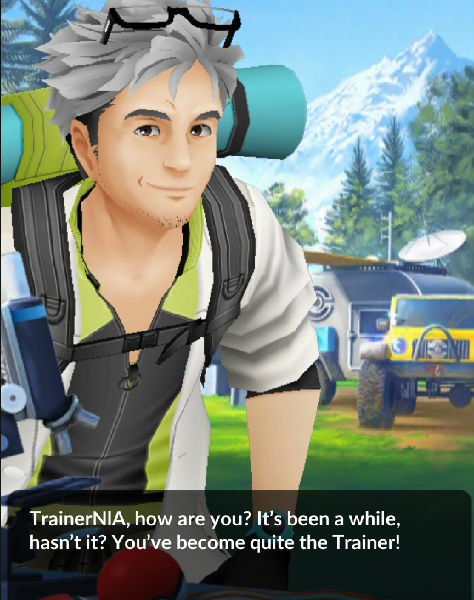 "Special Research" involves completing requests from Professor Willow himself. Maybe he'll ask you to turn the crank on the Candy-making machine we've been throwing our Pidgeys into since the summer of 2016. Can't blame the man; he needs to rest his arms. Hi, Prof. Your soul is filthy with the murders of millions of Pokemon. You can participate in multiple research missions per day. You earn one stamp for every day you participate, and when you collect seven stamps, you get a "Research Breakthrough" that rewards you with special items or a chance encounter with a "Special Pokémon" (Mew could it be?). Learn more about the event on Pokémon GO's official page. If this is enough to get you back into playing Pokémon GO after a long break, feel free to limber up with our Pokémon GO guides and tips.